As societies become increasingly complex and unpredictable, cities’ decision-making models and strategic development tools also need to evolve. Here is a case study to illustrate how a simple public consultation process can provide a clear understanding of a social system. The process is based on notions from systems thinking, complexity and network theory. Take the city of Amarante, Portugal. A city located 50km away from Porto, nestled between the famous Douro River Valley and the Mountain ranges of Marão, Amarante is part of the URBACT City Center Doctor (CCD) network and has been carrying out a series of public consultations since December 2016 to diagnose the health of its city-centre. One of the actions carried out by the URBACT Local Group consisted of using the Start-Stop-Continue-Improve assessment tool. This simple tool involves asking people on the streets what they would like to see started, stopped, improved and continued in the city centre. This exercise was done twice in Amarante. First, we heard the voices of our European partners during a visit of the group to Amarante in December. Then, in January, the URBACT Local Group took to the market on a Saturday morning and spent a good part of the morning asking shoppers to contribute to this diagnosis exercise. The exercise, besides being fun and engaging, produced a collection of “post-it notes” gathering dozens of ideas and suggestions, some of them quite unexpected. What to do with all the “post-its”? In a recent Local Action Group meeting in Amarante, the results from these actions as well as an online survey were presented to the group and provided a lot of material for interesting discussion. But, beyond providing kindling for debate, can this collection of “post-its” reveal deeper insights? Systems Thinking (ST) is a discipline that invites you to look for the underlying structures that promote specific patterns of events. So Systems Thinking is the perfect tool to use when you’re trying to look beyond the obvious and beyond the data you have just collected. It focuses on the relationships between variables rather than on the variables themselves. In our case, we were looking for a better way to have a bird’s eye view of what the citizens were telling us. Are there any hidden patterns? Are there any relationships between the proposals put forward? Are there any significant clusters of actions? What is the leverage of each action, i.e. are there any actions that have a potentially higher impact? To start answering these questions about the citizens’ proposals and possible actions, we need to convert these actions into a system. A system with elements (the suggestions for start-stop-improve-continue) and links between them. 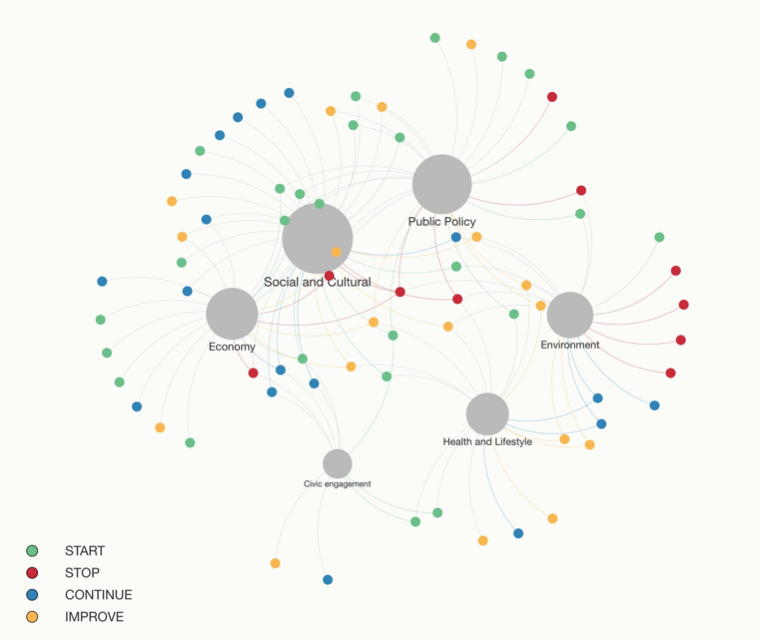 We used Kumu.io to create a network map of all the actions. Kumu.io is a powerful web application that promises to provide clarity from complexity by allowing you to perform network analysis, systems and stakeholder maps. To start unleashing the potential of the map of Amarante citizens’ ideas, we had to first go through a step of adding metadata to each action. First, we created a new field for each action called Quality of Life (QoL) factor and tried to assign one or more factors to each action. For example, the action “Improve the look of some stores” was linked to QoL factor “Economy” and “Social Cultural” while “Develop regular river clean-up plan” was linked to “Environment”. This created the first set of links between the actions and brought us a step closer to having a network of actions. The result of this mapping can be seen using this link. Feel free to open and explore. The QoL factor with the most actions appended to it, is “Social and Cultural” with 32 actions, followed by “Public Policy” with 26. The two actions with highest impact potential are the ones related to “preservation of landscape and heritage” and “conservation of green space and environment”. The first conclusion results from calculating the degree of each node of the network consisting of the actions, the QoL factors and the tags. The second conclusion was derived by calculating the so-called eigenvector centrality of each node. Eigenvector centrality measures how well connected an element is to other well-connected elements. In general, elements with high eigenvector centrality are the leaders of the network, though they may not have the strongest local influence. The argument is that carrying out actions with higher eigenvector centrality will have an indirect impact on several other QoL factors. We now live in an extremely complex and uncertain world and we urgently need new tools to assist in decision and strategy making. The age of analysis and linear thinking has taken us this far. We are entering the age of synthesis. For urban systems, this means that we are able to characterise and promote the elements of the urban ecosystem – such as mobility, energy infrastructure, citizens, businesses, places and spaces – very well. Now it’s urgent to focus on the interactions, the relationships and the behaviour that emerges from the interactions between them. This example shows how some concepts of Systems Thinking, together with powerful visualization tools, can help urban strategists make more sense of data gathered from simple public consultations like the start-stop-continue-improve approach. But the promise of Systems Thinking and network analysis tools doesn’t end here. Here is another example being developed in Amarante by Casa da Juventude, where we are trying to raise public awareness about supporting local organic farming, Fair Trade and the Sustainable Development Goals. 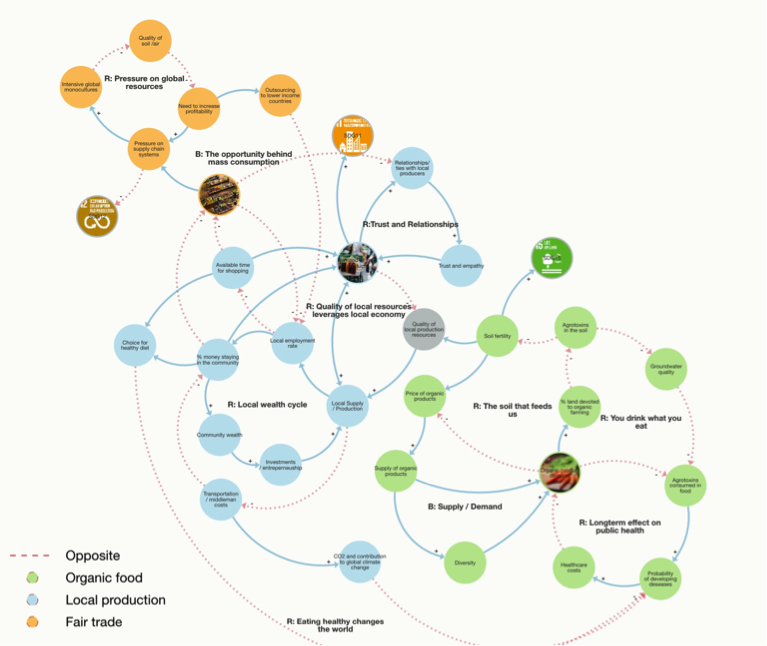 Using this causal loop diagram and the narratives it supports, it is possible to follow through the cascade of effects that a simple choice has at individual, local and global levels, and in many subsystems such as public healthcare, soil fertility, employment and wealth. As the technology and science become available, urban stakeholders see the use of these tools and paradigms of thought, coupled with participatory methods, as the future of smart city management. The City Centre Doctor team would be happy to share more information about the methods used in Amarante and about systems thinking in general. Please get in touch if you would like to experiment with these practices in your city or you have your own cases to share.